We’re finally seeing some fall colors here in the Blue Ridge Mountains after some cold weather hit. The good news about being an artist is that we can hurry the fall colors along in our paintings, and I confess to doing a little of that in some of my recent watercolors. I love painting fall colors! The first one I did from a shot taken at the Raven’s Roost overlook on the Blue Ridge Parkway. 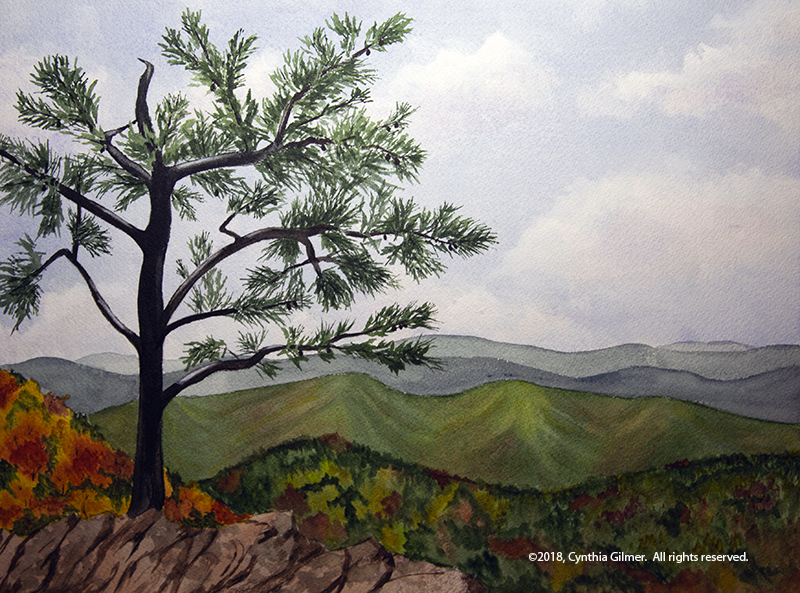 There’s an iconic pine tree perched on a rocky point there that is a much photographed and much painted scene. I took the photo in September, but painted it more recently and decided to add some fall colors to the mountainside in the foreground. This is my second attempt at this scene, the first was okay, but I felt the tree trunk was too heavy in that version. This is 16×12 on Arches 140lb cold press using Da Vinci watercolors. Fall in rural Virginia means hay bales. With all of the rain we got this year we have more than ever. A few weeks back I attended the Lynchburg Art Festival where my cousin’s husband Rodney Laughon, a wonderful landscape painter, exhibits. My cousin said his paintings of hay bales always sell. Plus they are such fun to paint. So with that inspiration I’ve been out with my camera collecting reference photos of hay bales. This photo was taken from a trail that runs along the Rockfish River near the village of Wintergreen. The mountain looming in the background is Three Ridges…one of my favorite subjects. The line of trees was not nearly so colorful in my photo, but it is fall, so I helped them along. This is 16×8 on Arches 140lb cold press using Da Vinci watercolors. 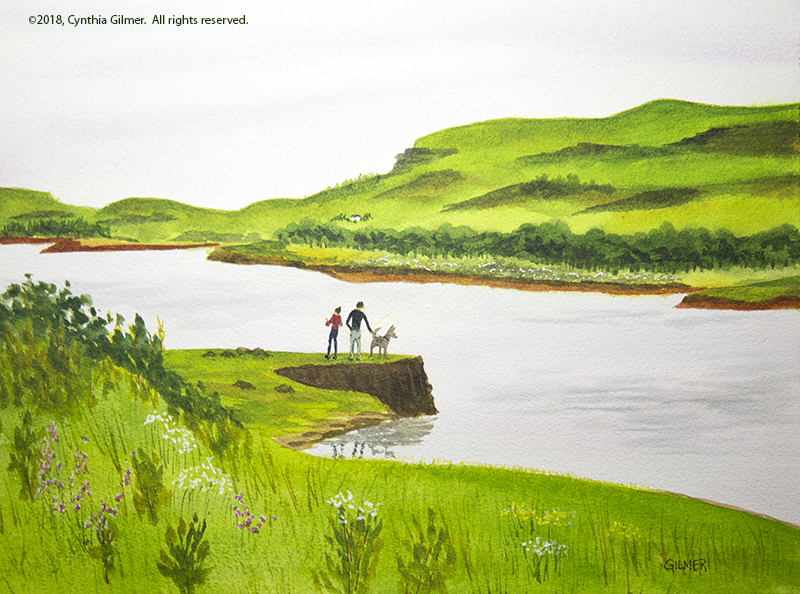 Finally, and this is not fall in Central Virginia, I painted a scene from my Scotland trip in June. I love this scene because of the people and their dog out enjoying the magnificent view on the point. Everything was so green! The photo was taken at Dunvegan Castle & Gardens on the Isle of Skye. This is 12×9 on Arches 140lb cold press using Da Vinci watercolors.